‘Monsters vs Aliens’ is an upcoming animated 3D feature film from DreamWorks Animation. This will be the first computer animated film which will be produced in real 3-D instead of converting the film into 3D after it is finished. The film is rated PG for its "Sci-fi Action, rough Humor, and Mild Language. DreamWorks has unveiled the official poster for ‘Monsters vs Aliens’. The flick is directed by DreamWorks filmmakers Rob Letterman of ‘Shark Tale’ and Conrad Vernon of ‘Shrek 2’. Henry Jackman has composed the music for this film. The film is starring the voices of Reese Witherspoon, Paul Rudd, Hugh Laurie, Seth Rogen, Will Arnett, Rainn Wilson, Stephen Colbert, Kiefer Sutherland and Jimmy Kimmel. Paramount Pictures is distributing ‘Monsters vs Aliens’ and is set to release on 27th March, 2009. 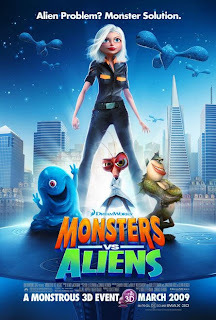 0 comments: on "Official poster of DreamWorks’ ‘Monsters vs Aliens’"